The moment you lay eyes on this ring, there’s no doubt that it’s special. This is one of our very own custom cut, natural peach morganite halo engagement rings. To build this ring, we started with a natural color non-treated Morganite stone sourced from Ethiopia. The gorgeous peach coloring really sets it off. Next, we custom cut in order to maximize every bit of its potential. This means that we didn’t simply take a pre-cut stone from the source. Instead, we put in the extra effort to perfectly craft the jewel into exactly what we wanted for this setting. Finally, we set the finished morganite in a white gold/white diamond halo atop a 14k rose gold band. Every different color shade in this ring flows beautifully from one to the other. 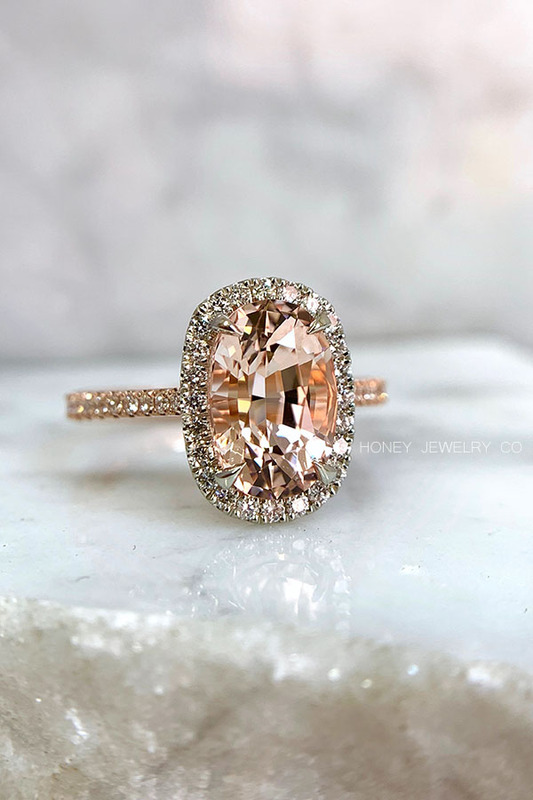 The peach morganite and the rose gold, especially. It’s part of our philosophy that when your heart is set on an alternative engagement ring, you should unequivocally demand the same level of craftsmanship that you would expect from a diamond. Even though a well-sourced natural morganite stone is always beautiful, it can only become truly radiant in the hands of a skilled artisan. We are in love with bringing our clients’ dream jewelry to life. There is no greater feeling than the one that comes after we’ve delivered a piece to be cherished for many lifetimes. For more inspiration, take a look at our full line of custom engagement rings or find the perfect pairing with one our custom wedding bands.